Over the course of his 20-year career, New York City native Darrell Smith has played drums with some of the most in-demand musicians across many of the world’s most famous stages. From humble beginnings in the basement of his home in Staten Island, to the halls of the esteemed Fiorello H. LaGuardia High School (a.k.a. “The Fame School”), and The New School for Jazz and Contemporary Music, Mr. Smith has been recognized for his prodigious talent with numerous awards and honors (including a scholarship to the Manhattan School of Music Pre-College Division and the Principal’s Award for Excellence in Contribution to LaGuardia High School). 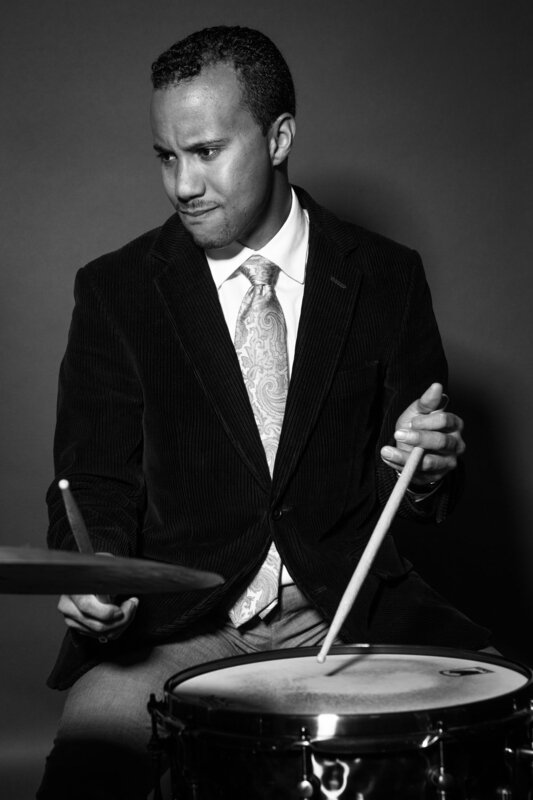 His educational foundation from some of the most prestigious institutions in New York, along with instruction and mentorship from acclaimed musicians like Kenny Washington, Ali Jackson, Dafnis Prieto, Bernard Purdie, and Billy Hart, has propelled him to success as one of the most sought-after young drummers in the city. As a band leader, Mr. Smith frequently performs with his Dal Segno Trio at popular New York venues where they are celebrated for high-energy, spirited performances. He has been featured in festival performances locally and internationally at the Newport Jazz Festival in Rhode Island and the Bern Jazz Festival in Switzerland. A recent tour brought him all the way to Bangalore, India where he played several shows to sold-out crowds with the Will Galison Quartet. Mr. Smith also held a residency as the drummer for the jazz brunch at Smoke Jazz Club for the last seven years. As a composer and drummer, Mr. Smith also has extensive experience with musical theater in Off-Broadway and national productions. His original music for the New Orleans-themed play “Interludes” was featured in their performances at the 2015 San Diego International Fringe Festival and the 2017 New York Fringe Festival. Over the past several years, Mr. Smith has also played drums and percussion for productions like “West Side Story”, “The King & I”, “Pearl”, and “Magdalene”. In addition to working as a band leader and drummer, Mr. Smith is a highly-respected and gifted educator. His current tenure as an instructor at the world renowned education program at Jazz at Lincoln Center has given him a platform to spread his passion for jazz to hundreds of talented young musicians around the city. He also teaches privately at Staten Island Academy and Victory Studios in his hometown of Staten Island. Mr. Smith is currently pursuing his Doctor of Musical Arts at SUNY Stonybrook as a student and graduate teaching assistant with jazz program director Ray Anderson.